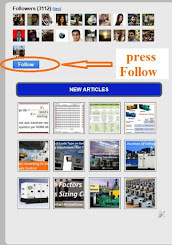 Dips are usually happened when there is a transient condition applied to a generator. Whenever a load is applied to or removed from a generator set, the engine speed rpm, voltage and frequency are temporarily changed from its steady-state condition. This temporary change is called transient response. The electrical inertia of the other loads in the system. The time required for the generator set to return to its normal steady-state speed is called recovery time. 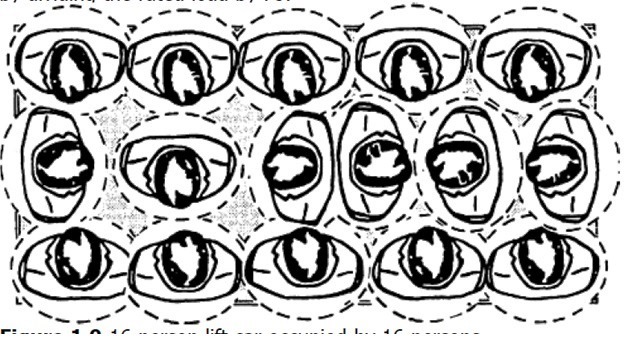 See Figure.1. This describes the largest decrease in voltage that happens the moment after a load is added to the electrical bus. This statement refers to the voltage level that the generator set recovers to sometime after a large load is applied. The larger the voltage dip a generator set can tolerate, the smaller and perhaps more economical the generator set can be. 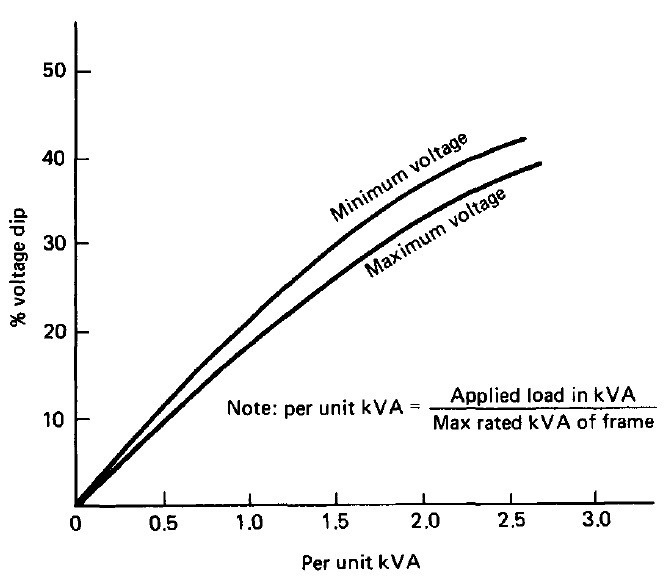 The amount of voltage dip is independent of the level of load already carried by the generator, particularly where that load is of a mixed nature (i.e. it consists of heating, lighting, and general power). The maximum frequency dip is about 25% but modern equipment is restricting this to tighter margins. A frequency dip above 35% may cause the engine difficulty in recovering. Frequency dips are normally more tightly controlled than voltage dips because they are typically connected to more sensitive electrical equipment. Typical voltage dip limitations are found in Table-1 for various facilities. Apartments, libraries, schools, and stores. Lighting load, large Flickering objectionable. Mines, oil field, quarries, asphalt, plants. Power load, large Flicker acceptable. Greater voltage fluctuations permitted with emergency power systems. Four performance classes are designated in ISO 8528-1-7 to describe a generator in terms of voltage and frequency. Table-2 below lists the performance class and their criteria and application examples. The performance class relevant for the application must be followed to be within the standard and achieve maximum performance. Required for applications where the connected loads are such that only basic parameters of voltage & frequency need to be specified. Required for applications where the demand on voltage is very much the same as for the commercial power system. 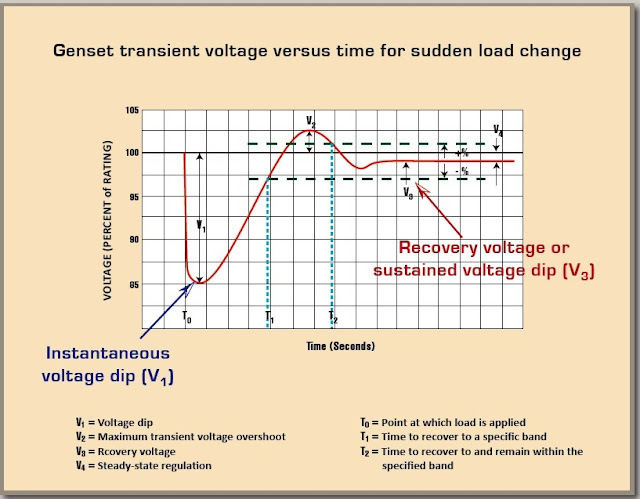 When load changes, temporary deviations in voltage and frequency are acceptable. Required for applications where the connected equipment may make severe demands on voltage and frequency and waveforms. Required for applications where the demands on voltage, frequency, and waveform are extremely severe. Table-3 shows the acceptance (dip) and rejection (overshoot) parameters identified by ISO 8528-5. Class G4 is reserved for limits that are unique and must be agreed upon by the manufacturer and customer. ISO 8528-5 also sets limits on recovery times for each class and identifies how recovery time is measured. AMC: Agreed between Manufacturer and Customer. The voltage regulator is a key component in determining the amount of voltage/frequency dips and recovery time. Digital Voltage Regulator (adjustable Volts/Hz). It attempts to maintain rated voltage as the load is applied. Since the generator is maintaining rated voltage, it is maintaining applied load (ekW). Therefore, when a constant voltage regulator is used, it imposes increasing torque on the engine during frequency dips. Since most generator engines are not designed for increasing torque, significant amounts of frequency dip can occur. Engine speed rpm decreases as any load is imposed on a limited bus (generator). This causes frequency/voltage to dip accordingly. 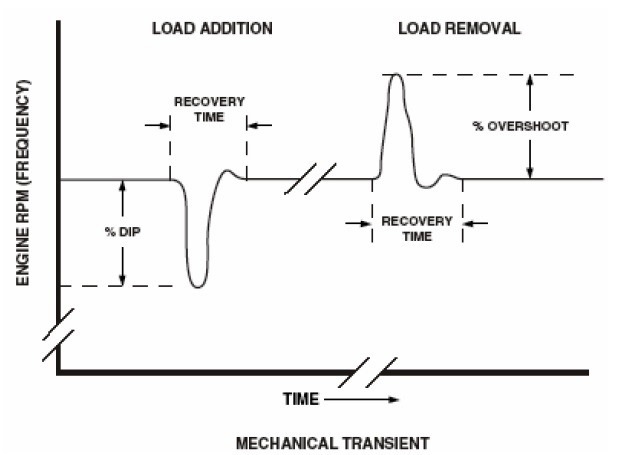 Greater loads applied to the generator will impose a greater percentage of dip; greater loads will also require more time for the engine to recover. It was designed to impose a decreasing torque on the engine during frequency dips. The Volts/Hz schedules voltage proportionally to speed. Technology has allowed an increase in engine ratings. This increase creates the possibility of more severe transient loading. In some cases a Volts/Hz regulator cannot prevent excessive frequency dip because of large load changes; the torque has increased so much the deceleration on load is extreme. A 2 Volts/Hz regulator has been developed to address this situation. The 2 Volts/Hz regulator decreases voltage at twice the rate of frequency dip. At 15% engine speed, the voltage would dip to 30% (2 x 15%) and the load would be reduced to 70%. The kW absorbed by the load is then 0.70 (70% of volts) multiplied by 0.70 (70% of current) or 49% of rated hp. If the generator is large enough to carry the running load the 2 Volts/Hz regulator may help in motor starting. A reduced motor starter may not be required with the 2 Volts/Hz regulator when starting large motors depending on system design and applied load steps. However, the entire connected system would have reduced voltage, not just the motor. The digital voltage regulator is a microprocessor-based voltage regulator. Its main purpose is to regulate output voltage of an engine generator set. It is designed to improve performance by allowing regulation characteristics to be modified that were previously not modifiable. This allows the engine generator set to function in a more efficient manner and to provide improved performance to the customer. The digital voltage regulator can be software configured to optimize the transient response of any Caterpillar generator set package by changing the under frequency characteristics as well as the control loop gains. 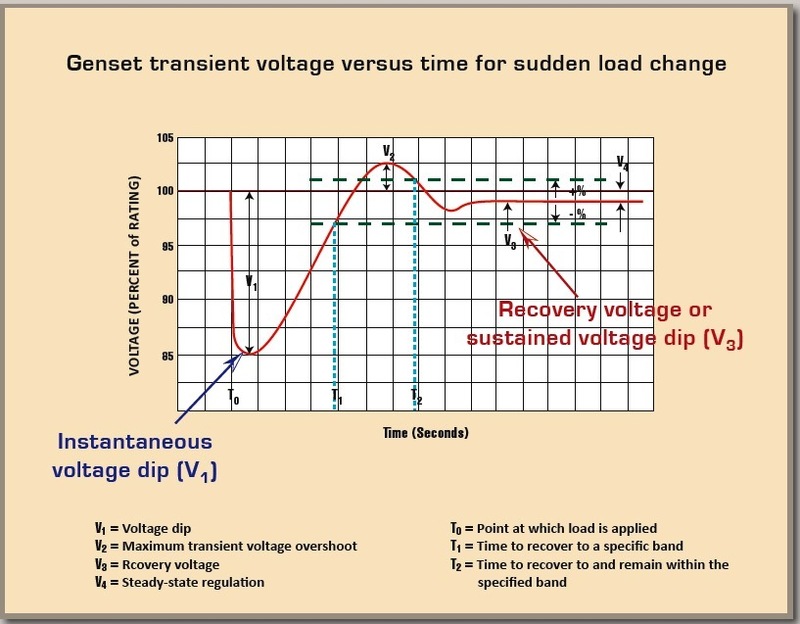 Generator manufacturers supply performance data (usually in the form of curves supported by application notes) enabling determination of voltage dips for given impact loads. Examples of such data are given in Figures.3 which shows typical 3-phase voltage dip characteristics, based on results using ultraviolet recorder measurements. The performance curves are for a specific frame size. The terms 'minimum' and 'maximum' voltage refer to the bottom and top ends of the standard range of voltages available from the particular winding applied to the machine. Typically, these may be 346 volts and 480 volts, respectively. The 'maximum rated kVA of the frame' is its standard (industrial) continuous maximum rating. In all instances, the impact current must never exceed the machine's declared overload capability.